RAJSHAHI, May 27, 2018 (BSS) - West Zone of Bangladesh Railway will operate Rajshahi-Dhaka Eid special train with the main thrust of reducing sufferings of the passengers in general during the Eid festival. 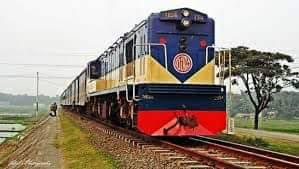 The train named "Eid Special" will run on the route with sixteen bogies from three days ahead of the Eid and will continue till four days later, confirmed yesterday by Golam Mostofa, Superintendent of Rajshahi Railway Station. The train will depart Rajshahi station for Dhaka at 1.30 pm and is scheduled to reach there at 8.20 pm. On the return path, the train leave Dhaka for Rajshahi at 9.25 pm and reach here on the following 3.30 am, he added. Besides, the three existing intercity trains- Silk City, Padma and Dhumketu- on the route will continue as usual. However, day off for the intercity trains has been withdrawn from five days ahead of the Eid day. Golam Mostofa says advance tickets for both the destination and return will be available from 10 days ahead of the Eid day. Law enforcing agencies will work for combating the passengers' sufferings. Necessary efforts were taken to avert any problem relating to ticket selling. Apart from, overall security measures were enhanced to make the Eid event a total success, Golam Mostofa added.